Kyaikhtiyo Pagoda is located about 160km from Yangon. Rising 1100 metres above sea level, this small golden stupa stands on the top of a huge gold-gilded boulder. 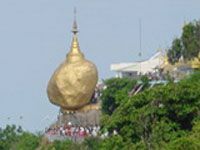 This Golden Rock is precariously perched on the edge of the hill and is a place of important pilgrimage for Buddhists. Early morning drive to Kyaikhto via Bago and Sittaung bridge (5hrs.drive). Arrive at Kinmon base camp and proceed to transit camp by pickup truck (1hrdrive). Light trekking to GoldenRock (1 hr). Overnight at hotel in your hotel. Walking around the environs of Golden Rock Pagoda to enjoy the great scenic beauty and witness the village life. Return to base camp on foot. Drive back to Yangon.